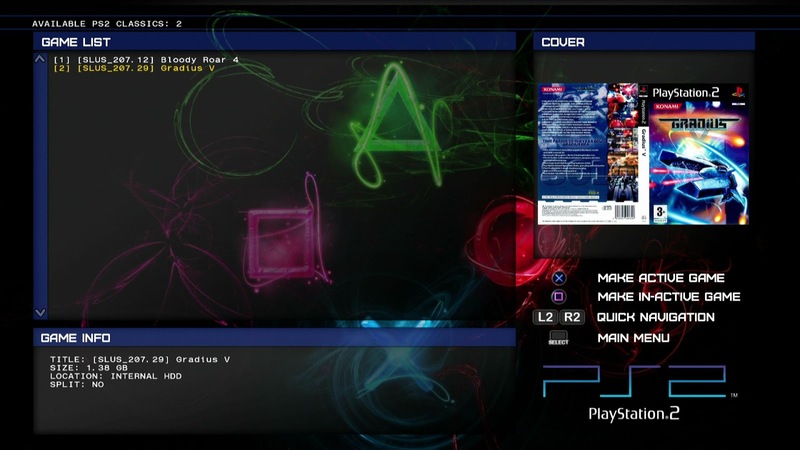 Here you have the BETA / Test build of PS2 Classics Manager v1.0. This release is not the final version, this is a working build, but it has a couple of things that need to be enhanced to work better and cleaner. Be aware that this release doesn't support EXTERNAL games. Before using this application you MUST read the following guide, because this application depends on PS2 Classics Placeholder and the converted ISOs. NOTE: Use the new PS2 Classics Placeholder R2. Inside the PS2 Classics Placeholder R2 RAR I included 2 VME (SCEVMC0.VME, SCEVMC1.VME) files to be used for your converted ISOs, they are clean. Keep reading to understand how to set them up properly for each game. If you already have my previous release of the PS2 Classics Placeholder, make sure you remove any ISOs you put inside the USRDIR directory and remove / uninstall it from XMB. Then install the latest R2 release of the placeholder PKG. On XMB go to "Game->Save Data Utility (PS2)->PS2 Classics Placeholder" and delete it. Example: "/dev_hdd0/PS2ISO/[SLUS-20312] Final Fantasy X"
Future builds of PS2 Classics Manager will use the naming standard to look for information of the game on a custom database. If you don't name your directories correctly then you will not benefit from this future feature. Note 1: USE THIS DIRECTORY STRUCTURE IF YOU WANT TO AVOID POSSIBLE ISSUES, IT JUST TAKES A COUPLE OF SECONDS. Note 2: If you use high resolution covers they will take some seconds to load, this can impact performance so it is recommended to use 480p PNGs. PS: I will now go to sleep since its 5AM here xD. Tomorrow (or I should say today lol) I will be a bit busy doing some homeworks but after I'm done with them I will keep working on PS2 Classics Manager .